The Ink Business PreferredSM Credit Card from Chase is a small business card with a generous rewards program that rewards spending in certain common business categories, including travel, communications, digital advertising, and shipping. Though its $95 annual fee isn’t waived during the first year, it has a juicy sign-up bonus offer that’s worth up to $1,000 upon at least $5,000 in spending within 3 months of account opening. Chase Ink Business Preferred is great for small business owners who travel frequently, buy online advertising, and ship physical merchandise often. It replaces the Chase Ink Plus business card, whose rewards scheme was similar, if slightly less generous. It represents a step up from Chase Ink Business Cash Credit Card, a no-annual-fee small business card that rewards spending at office supply stores, communications companies, restaurants, and gas stations. Even if you’re a freelancer or sole proprietor with no employees and no physical office space, you may still qualify for Ink Business Preferred. All you must do to qualify is affirm that you’re the owner or representative of a formally incorporated business, including a sole proprietorship, and that you plan to use the card exclusively for spending related to that enterprise. When you spend at least $5,000 within 3 months of opening your account, you earn 80,000 bonus Ultimate Rewards points. That’s worth $1,000 when redeemed for travel purchases, and $800 when redeemed for cash back or general merchandise. Ink Business Preferred earns 3 points per $1 spent on telecommunications purchases (including Internet, landline phone, cell phone, and cable TV), travel purchases, certain types of digital advertising purchases, and shipping purchases, up to a combined annual spending limit of $150,000 across all of these categories. All other purchases earn 1 point per $1 spent, including communications, travel, advertising, and shipping purchases above the $150,000 spending limit. The annual limit resets on the anniversary date of your account opening. You can redeem your accumulated points for a wide range of goods, services, and monetary items in Chase’s Ultimate Rewards marketplace. Your options include travel (including hotels, rental cars, and airfare), general merchandise, cash and cash equivalents (such as statement credits and bank account deposits), gift cards from dozens of online and offline merchants, bespoke experiences (such as dinner cruises), and more. You can also shop with points at Amazon. There’s no minimum threshold for cash redemptions. Minimums vary for other redemption types, but are generally a function of the underlying value of the product or service for which you’re redeeming. Points are usually worth $0.01 apiece at redemption, but there’s one valuable exception. Travel purchases, including airfare and hotel stays, value points at $0.0125 apiece, effectively boosting their value by 25%. Whereas 50,000 points are worth $500 when redeemed for cash, they’re worth $625 when redeemed for travel. You don’t have to redeem your Ultimate Rewards points through the Ultimate Rewards portal. If you prefer, you can transfer them on a 1-to-1 basis to about a dozen popular frequent travel programs, including Marriott Rewards, Southwest Airlines Rapid Rewards, and British Airways Executive Club. You usually need at least 1,000 points to execute cross-program transfers. If you travel with a variety of airlines and hotel providers, this benefit has tremendous potential value, as the transfer ratios of many competing credit cards can be as low as 5-to-1, or even 10-to-1. Those depressed ratios sharply devalue accumulated points during the transfer process. 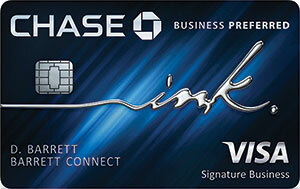 Those who carry the Chase Ink Business Preferred Card get access to the free Ink mobile app. The app’s capabilities include category tagging for ease of record-keeping, full tracking of authorized card users’ spending patterns, one-click changes to authorized users’ spending limits, real-time alerts whenever a purchase is charged to your account, and more. Chase Ink Business Preferred’s regular APR ranges from 18.24% to 23.24% variable, depending on prevailing interest rates and your personal creditworthiness. The cash advance APR is 27.24% variable from the day you open your account. There is no penalty APR. The $95 annual fee is not waived during the first year. There is no foreign transaction fee. Cash advances cost the greater of $15 or 5%, and balance transfers cost the greater of $5 or 5%. There is no fee for additional employee cards (authorized user cards). These cards earn rewards at the same rate as the primary cardholder’s card. This is one of Chase Ink Business Preferred’s fringe benefits. If you need to cancel or cut short your trip due to certain uncontrollable situations (such as illness or severe weather), Chase may reimburse prepaid, nonrefundable expenses up to $5,000 per covered trip. Such expenses include airfare, trip packages, hotel stays, and tours. Ink Business Preferred cardholders enjoy complimentary purchase protection insurance, which covers theft and damage to purchased items, up to $10,000 per item and $50,000 total (lifetime) per account. This benefit can be applied to repair or replacement costs; however, it must be invoked within 120 days of a covered item’s purchase. Ink Business Preferred extends original warranties for an additional year, provided the original warranty was slated to last no longer than 3 years. In keeping with Ink Business Preferred’s communications-friendly rewards program, this card comes with a cell phone protection plan that reimburses losses due to theft or damage – up to $600 per incident, and up to 3 incidents per 12-month period. Covered phones can belong to you or your employees, but their monthly bills must be paid with your Ink Business Preferred card. Each claim has a $100 deductible. Chase Ink Business Preferred requires excellent credit. If you have any noteworthy blemishes on your credit report, you’re unlikely to qualify. Very Generous Sign-up Bonus. Chase Ink Business Preferred’s sign-up bonus is huge. At 80,000 points, it’s worth $800 when redeemed for cash and $1,000 when redeemed for travel. That’s head and shoulders above many direct competitor cards, such as Business Green Rewards from American Express (whose sign-up bonus is worth just $50 under most circumstances) and Spark Cash for Business from Capital One (whose sign-up bonus is worth $500 cash). 1-to-1 Point Transfer With About a Dozen Loyalty Programs. You can convert your accumulated Ultimate Rewards points into loyalty currencies issued by about a dozen other travel rewards programs at a 1-to-1 ratio. Since most branded travel rewards programs assign variable values to their points, this is a hugely valuable benefit that can significantly magnify your points’ purchasing power under the right circumstances. Some competing cards don’t offer point transfers at all. Among those that do, many settle for sub-par transfer ratios – as high as 10 original points to 1 partner point in some unfortunate circumstances. High Spending Limit in 3x Categories. This card’s favored spending categories – travel, communications, shipping, and digital advertising – earn 3 points per $1 spent on combined spending up to $150,000. That’s a huge spending limit that’s probably beyond the capacity of many small business owners and sole proprietors. Points Worth 25% More When Redeemed for Travel. Travel redemptions boost the value of Ultimate Rewards points earned with Chase Ink Business Preferred by 25% – turning 80,000 points, normally worth $800, into $1,000. By contrast, points earned with American Express and Capital One business credit cards are generally worth $0.01 apiece or less. No Fees for Employee Cards. You don’t have to worry about paying extra for employee cards, no matter how many people you have working for you. That’s great news for business owners who trust multiple employees to make purchasing decisions. No Foreign Transaction Fee. This card’s lack of a foreign transaction fee is great news for business owners who routinely venture outside the United States. Many competing business cards add 2% to 3% to purchases made outside the U.S. – a major drag for world travelers. No Minimum Threshold for Cash Redemptions. You can redeem your Ultimate Rewards points for cash in any amount. That’s a welcome contrast with some other Chase credit cards, which require at least 2,000 points ($20) for cash redemptions, and great news for business owners who don’t want to wait to hit an arbitrary threshold to reap the fruits of their spending. Charges an Annual Fee. Chase Ink Business Preferred has a $95 annual fee that’s not waived during the first year. If you’re looking for a business credit card with above-average rewards and no annual fee, stick with Chase Ink Business Cash. No Introductory APR Promotion. This card has no introductory APR promotion – its regular interest rate is fixed from the day you open your account. Some comparable cards, including Chase Ink Business Cash, have 12- to 15-month 0% APR purchase and balance transfer promotions. High Fees for Balance Transfers and Cash Advances. This card’s cash advance and balance transfer fees are unusually high – the greater of $15 or 5% for the former, and $5 or 5% for the latter. If you’ve racked up high-interest credit card balances on another business or personal card, Chase Ink Business Preferred is not the ideal vehicle to pay down those debts. If you’re a frequent, enthusiastic traveler, the Chase Ink Business PreferredSM Credit Card has a lot to offer beyond its attractive 3-point-per-$1 earning rate on business travel purchases. The real secret to this card’s power lies in its 1-to-1 point transfer ratio, which lets you convert your Ultimate Rewards points into loyalty currency with about a dozen other hotel companies and airlines. Since many branded loyalty programs value their points far higher than $0.0125 apiece – the top valuation for Ultimate Rewards points – the even transfer ratio potentially stretches your points (and the dollars you spend) much further than normal. Why not sign up today and see how much you can earn. The Chase Ink Business PreferredSM Credit Card is an ideal rewards credit card for small business owners who spend heavily in its favored categories: travel, communications, shipping, and digital advertising. It’s particularly exciting for business owners who travel frequently, whether for business or pleasure, thanks to a pair of key features: the 25% value boost on points redeemed for travel at the Ultimate Rewards marketplace, and the 1-to-1 point transfer arrangement with about a dozen travel loyalty programs. Chase Ink Business Preferred isn’t appropriate for light-spending business owners who can’t afford (or don’t want to pay) the annual fee, nor for owners who travel too little to take full advantage of the transfer and point-boost deals. Chase Ink Business Preferred is a worthy successor to Chase Ink Plus, and an excellent complement to Chase Sapphire Preferred and Chase Sapphire Reserve. Key benefits include the very generous sign-up bonus, 1-to-1 point transfer with a number of popular travel loyalty programs, the high spending limit in the 3x categories, the 25% point boost on travel redemptions, the lack of a foreign transaction fee, the complimentary employee cards, and the lack of a minimum threshold for cash redemptions. Major downsides include its $95 annual fee, the lack of an introductory APR promotion, and the high balance transfer and cash advance fees.